A single-fan MSI Radeon RX 580 is just $165 after checkout code and $20 mail-in rebate at Newegg. Wow. 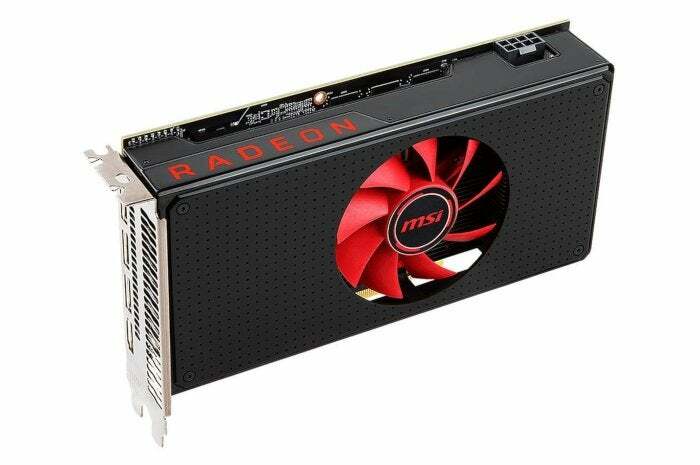 Just when you thought the graphics card deals couldn’t get any better, Newegg is selling an 8GB MSI AMD Radeon RX 580 for $165Remove non-product link after the checkout code EMCEERY39 and a $20 mail in rebate. That’s an incredible price well below the pre-Black Friday RX 580 sale prices of $200 to $220, and it’s nearly half of the $300 or so for a Radeon RX 590—the newly crowned 1080p gaming champ. The checkout code is from Newegg’s daily mailer so you may need to sign-up for Newegg’s email to get the deal. This is a single fan build of the Radeon RX 580, with reference clock speeds and a reference cooler. Still, it should offer the usual great RX 580 performance, which isn’t that much behind the much more expensive Radeon RX 590 and delivers awesome no-compromises 1080p gaming. The card should also perform well in 1440p resolution gaming at High settings, especially with its hefty 8GB of onboard memory. But wait! There’s more. On top of the card, AMD will toss in your choice of two free games from among three options: The Division 2, Devil May Cry 5, and Resident Evil 2. All of these games are slated for release in early 2019, and they are all highly anticipated additions to their respective series. We haven’t seen a more appealing graphics card deal than this in a long time. If you’ve been looking for a gaming upgrade but didn’t make the leap during Black Friday, do it now.